Ukraine only received half the amount of gas from Russia this past year after massive debt halted flows for a 6-month period between June and December. Kiev only bought 14.5 billion cubic meters (bcm) compared to 28.5 bcm in 2013. 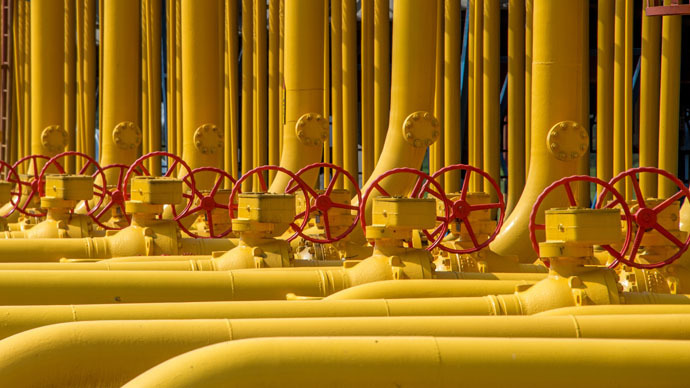 In total, Ukraine sourced 36 percent of its gas from Russia, 13 percent from the EU, and 51 percent was domestically produced, Ukrtransgaz, Ukraine’s state gas transport subsidiary, said in a statement on Tuesday. Russia’s state-owned Gazprom ceased gas delivery on credit to Ukraine in mid-June, and the taps were only turned back on in mid-December. Deliveries to Ukraine resumed after the country began paying off its more than $5 billion in arrears to Gazprom. By the end of 2014, Ukraine's gas importer, Naftogaz, had paid off $3.1 billion in gas debt, in two large tranches, one in November and the other in December. Ukraine only imported 40.1 billion cubic meters of gas in 2014, compared to 50 billion cubic meters in 2013. The energy crisis in the country forced it to turn to coal and wood for heat, and the country was hit with emergency blackouts to conserve energy. Energy in Ukraine is highly subsidized by the government. Kiev can buy gas from Russia at $378 per 1,000 cubic meters, a lower price than Russia offers most of its European clients. This deal is valid through March, to ensure Ukraine and Europe don’t face an energy crisis in the winter months, as in 2006 and 2009 when gas disputes between Ukraine and Russia resulted in gas shortages across Europe. The energy crisis in Ukraine has been deepening since anti-Kiev forces took over in the eastern regions, which produces the bulk of the country’s coal that is used to heat homes as well as generate electricity. Nearly 40 percent of Ukraine’s energy is produced from coal, and 90 percent of the mines are in the Donbass region. A majority of the coal plants have stopped production and more than half of the railways to supply what’s left have been shut down. On December 3, an accident at Ukraine and Europe’s largest nuclear plant, left dozens of towns without electricity. Limited natural gas, low stock piles of coal, emergency blackouts and lack of water, are making things worse for the people during the winter months. The Energy Ministry has imposed limits on electricity use between 8am and 11am in the morning and between 4pm and 8pm in the evening.